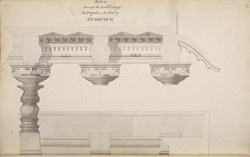 Pen and ink drawing of the section of the south entry of the Harihareshvara Temple at Harihar in Karnataka, from an album of 56 sheets of drawings (60 folios) mainly of miscellaneous architecture and sculpture in the Deccan and S. India, dated 1793-1806. Some drawings are by MacKenzie himself, others by his draftsmen, including C. Ignatio. The town of Harihar is situated on the right bank of the Thungabhadra river. The Harihareshvara temple is located in a large compound which includes the main temple and several small temples. The temple was erected in 1224 by a minister of the Hoysala king Narasimha II. The sanctuary faces east and is preceded by a closed hall with two side entrances and porches and an open hall, built on a stepped plan. The superstructure of the sanctuary is a recent addition. The parapet-walls of the porches are decorated with very fine carvings of small sculptures of gods. This drawing shows the section of the sothern porch. The great open hall has heavy bell pillars and its parapet is carved with figures of musicians and dancers. Within the shrine there is an image of Harihara, a divinity that represents both Shiva and Vishnu.